I realized that I don't really have much in the way of Easter decorations,so I've been thinking and working and researching...trying to come up with something that's meaningful and beautiful (as well as cheap). First, I remembered my friend Kendra from My Insanity grew wheatgrass last year and decided to try it out. We have had thee best time with this stuff. We started growing it Thursday and this is what it looked like Sunday afternoon, although by Sunday evening, it had doubled in size. We keep making comments about 'watching the grass grow'. Ha. Mr. C is determined to actually see it growing. He is convinced it waits until we are out of the room to sprout. It add just the right amount of Spring though, don't you think? I have four ramekins, two terracotta pots and three baskets full of the stuff. Plus it epitomizes instant gratification! Love that. Then I glued and painted and glued some more, and repainted and cut and hot-glued my fingers together until I came up with these two eggtastic projects. 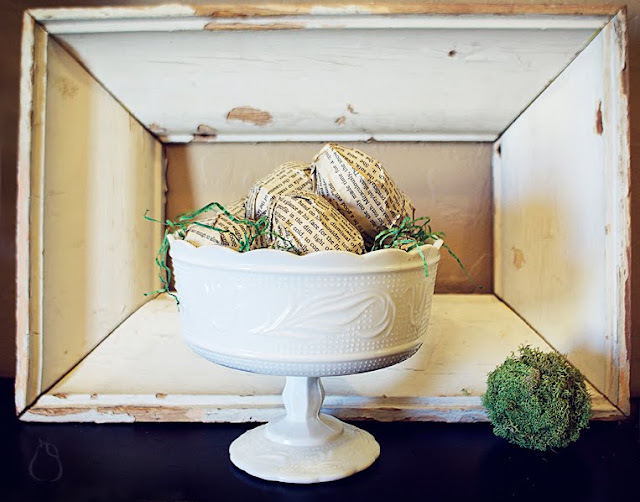 And hopefully you can tell that this first project is in fact eggs...covered in book pages. It took three coats of paint to get just the right blue and the perfect amount of speckles on these robin eggs. But I think they turned out in the end...and I love the moss. Apparently Miss B does too because she took a bit of it to start a moss garden in a paper plate of water. I had to sit her down and explain to her just how pricey this moss business is and that is strictly for crafting purposes....I guess she'll have to use her own money to fund her very own moss garden. This little guy (who looks half asleep or something in this picture) kept trying to steal my lovely robin eggs next. But I can't really blame him. They are a very fetching blue. Anyway, they turned out pretty close to what I'd imagined and will hopefully be a great reminder of the spirit of the season, which is exactly what I was hoping for. Although I have no idea what book page-covered eggs have to do with the true meaning of Easter...they just look cool...and they're eggs... I guess scripture would have been more appropriate, however I wouldn't feel comfortable ripping up scriptures. Maybe photocopied scripture...but then you lose the yellowed pages...oh the dilemma. 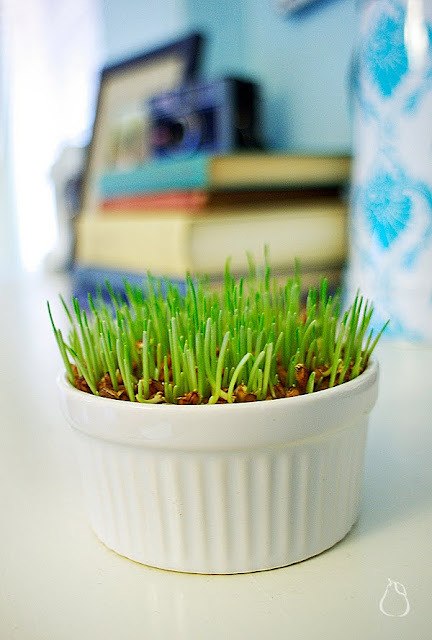 I love how your wheatgrass is looking! I'm so glad you and your kids are having fun with it! We started ours a bit late this year, but it does grow so fast, so hopefully, we'll be good for Easter dinner! 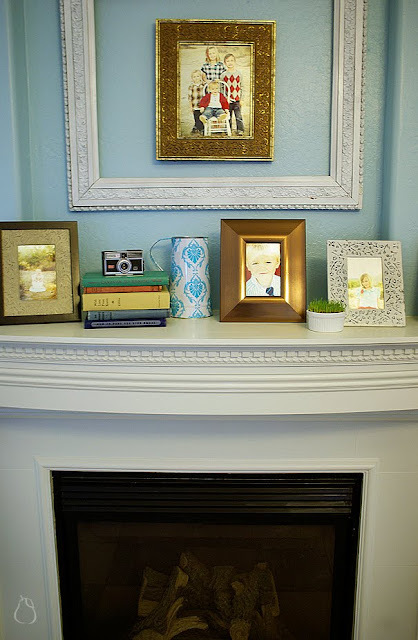 Everything in your home looks so lovely! 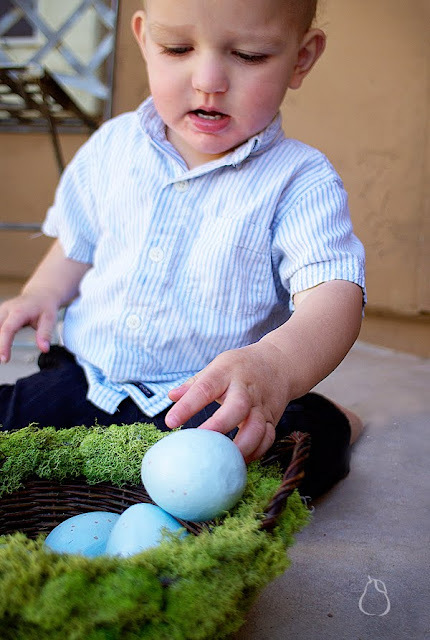 If you like playing with decorator tips, you should totally try the panoramic sugared Easter eggs. I had a friend show me how, and it was ridiculously easy. Not to mention FUN! You gotta tell kids not to eat them though. Blech. Egg white and sugar. Hey, looking good. Love the wheat grass idea. 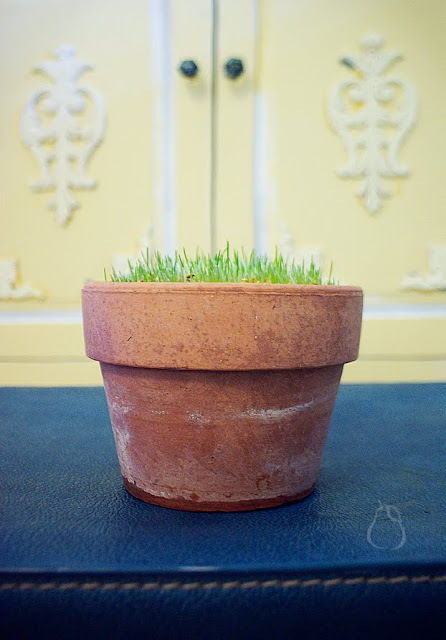 love the sweet projects, but I have a question... it's kinda gross... does your wheat grass attract tiny flying bugs? We had to ditch our pot of hyacinth because it got soooo buggy - do you have that problem? or is it just a testament to my bad housekeeping? E, so cute. I am jealous of your wheat grass, mine is definitely no where near the prosperity of yours. Also what kind of book pages did you use for your eggs I'm seeing words like dim light, his face, and her cold...seems like too good of a book to tear up. That grass is so lush and healthy...way to go green! Lovely job on the eggs too. Look so stinkin' cute. How do you grow wheat grass It's supposed to be very good for you if you juice it and have 1 oz of it a day, no need for multivitamins! Looks very good! Wow! How creative you are! ;) I don't have any easter things around the house...we did although get our lawn aerated and if you have a strong imagination, it kind of looks liek gigantic bunny poop. Does that count?